The undertaking of About-Face Missions came about through a series of events that can only be attributed to God. A chance Facebook connection between two Texas based Christians, each having a passion for missions, resulted in an idea which one month later led to the formation of this group. David Shelton and Missionary Jim (abbreviated for security reasons) met in April of 2011 originally as co-volunteers for Global Media Outreach through Facebook, and since working in the same city, met for lunch – a friendship began. David had been volunteering as an online missionary with Global Media Outreach for a couple of years prior. The Lord had connected him to an orphan teen named Ronald Mufebi in Uganda the previous year, who was surviving on the streets selling drugs. David led him to Christ. After observing how Ronald’s life had been drastically changed by the Lord, and that he was struggling to survive without family in a third world country, David and his wife felt led by the Lord to help extend the love of Christ to him by becoming surrogate parents, putting him through boarding school and mentoring him online. Ronald, 15 at the time, had a 19 yr. old friend in the gang, who was also trying to earn enough for school and survival, named Stanley. After Ronald had an encounter with God and met Christ. Soon he dropped out of the gang, in spite of the fact that it could cost him his life. Stanley saw the change in his friend and soon followed. He also gave his life to Christ despite threats of murder from the gang leader. As a result of dropping out of the gang, Stanley, like Ronald, was unable to continue school in 2010 because of a lack of money. He had yet to complete the 9th grade. During this time, David mentioned to Jim that high school was expensive for Ugandans and that many of the children, orphaned because of HIV, were forced to drop out of school. This touched Jim such that he began praying about helping in the same way should it be the Lord’s will. Although Jim knew God had called him to help, he was unable to shoulder the cost of such an undertaking by himself. After some thought and prayer, God led Jim to post the situation on Facebook to see if friends would be interested in helping. In less than three days, a few Facebook friends had come to help, allowing Stanley to return back to high school and provide him with basic food and rent needs. Shortly thereafter, the Lord gave Jim an idea and desire to move forward. He thought, “If the Lord could orchestrate such a “miracle” for a youth in Uganda using Facebook in connecting people, why couldn’t it be used to connect Christians to those doing God’s work in real time?” This led to the idea of About-Face Missions, (AFM). The Lord used this experience to amaze Ronald and Stanley’s school administrators in Africa when they learned that a few Americans who had never met these boys were committing to help them graduate. They too gave glory to God in seeing this along with the local Church which the boys became members. Jim and David Shelton partnered together in early summer of 2011 to form AFM ministry based primarily from Facebook contacts. The name came to them partly as a play on words since this began as a Facebook ministry. They felt strongly that God had called them into international mission work and to share the gospel, demonstrating the love of Christ, through helping the needy as they were able. About this time both David and Jim had recently what they called a ‘radical life-change’ to give up the life of living for sinful self, and to serve the Lord with all their heart. Both men will tell you that they both had 180 degree turns in their life directions…an about-face! This is a military term that means to turn around. 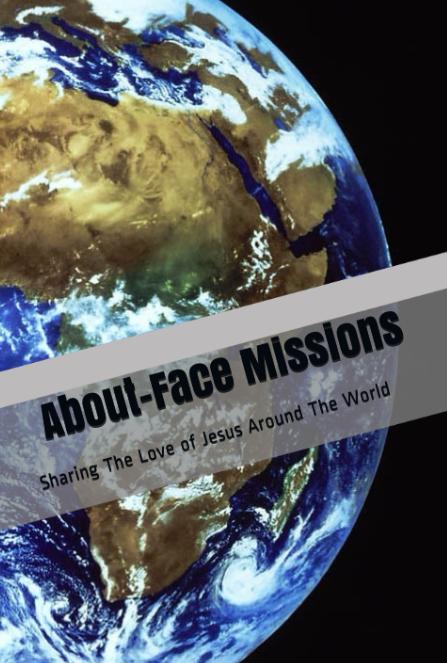 So naturally it made sense to call this new ministry About-Face Missions. As the work grew and built more relationships with pastors in less developed countries of the world, they were led to incorporate in May 2013 as a Texas Non-Profit and become a fully functioning 501c3 NGO founded on the principles of Christ as seen in the Bible. 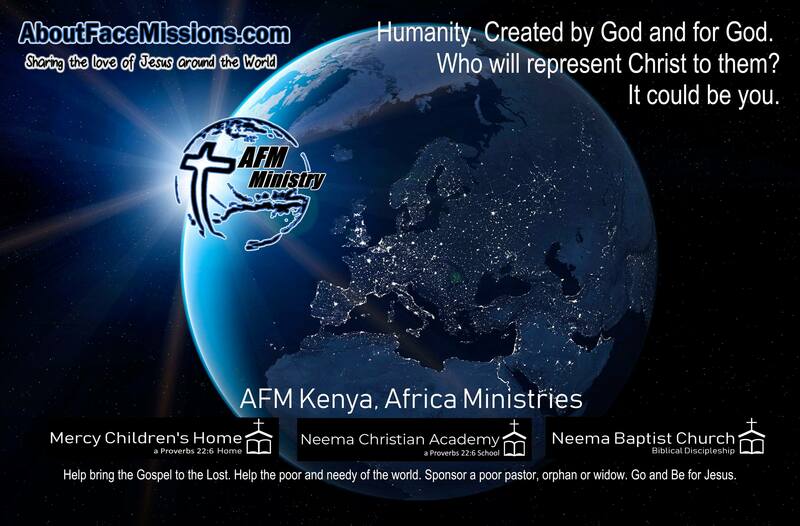 Thus began AFM Ministry, Inc, doing business as About-Face Missions as recorded and filed in Dallas County, Texas USA. 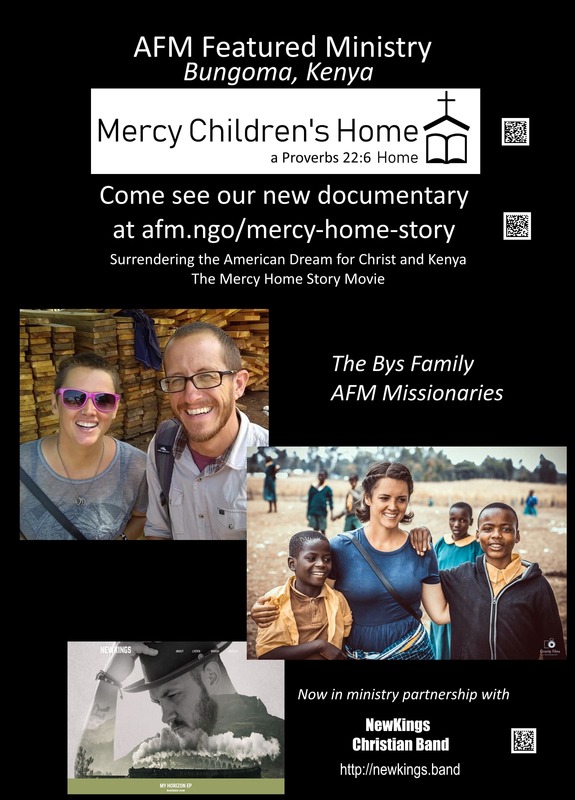 Today AFM is helping those who are working in Kenya, Uganda, Philippines, Nepal, India, Pakistan, Peru and SE Asia through our continued support of former co-founder Jim. We have continued to utilize Facebook and the Lord continues to bring volunteers who are willing to go out and serve and those who are supporting those who go.